This entry needed to be made separately from the other one I just did, because it has a more limited audience. You guys know me; every now and then, I spot an antique quilt top that is the right combination of appearance + price, and I bite on it. I bit on this one. When we were over at Hallie and Remy's a few months back, she asked if she could show me something. When we went to the back bedroom, she pulled out two sets of quilt squares. One was hexagons** and the other squares. 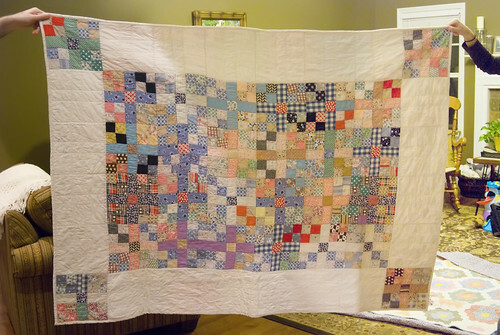 There were 29 squares in all, not enough for a full adult-sized quilt, and she wondered if anything could be done with them. I said yes.